Researchers of Valencia’s Polytechnic University (UPV), the University of Notre Dame (USA) and the Technological University of Auckland (New Zealand), along with multinational company Zimmer, have developed a new material that improves the quality and durability of the articular cartilage implants used in knee operations. According to the tests carried out, with this new material, the implants could last up to 80% longer than the ones currently used. This work has been published in the Materials Science and Engineering journal. Wear on cartilage is one of the injuries that most affects athletes such as runners, tennis and paddle players, and, generally, all those who practice a sport which entails high joint impact. The solution to this pathology commonly involves surgery, whereby the damaged cartilage is replaced with a 3D polymer with very similar mechanical features to natural tissue. This tissue must be porous enough for the bone and capillaries to grow inside. However, different studies conducted on this type of materials show that their resistance becomes lacklustre with time. “Use of the material we have obtained will enable an increase of the lifespan of these implants, with the resulting benefit for the patient”, highlight professors Miguel Ángel Sellés and Samuel Sánchez, from the Alcoy campus and researchers at the Material Technology Institute and the UPV’s Design and Production Institute, respectively. In order to obtain this new material – the first welded tissue used in this sector – researchers have developed a new technique based on the use of laser technology. “In our study we saw that in order to avoid cartilage wear, it is essential for the fibres to not skew sideways when submitted to normal loads – a perpendicular force to the implant’s exterior surface. To accomplish this, we propose a method based on selective laser welding of the superficial layers of the three-dimensional tissues,” Sellés explains. 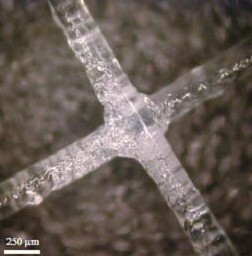 The technique used permeates the fibres of the polymeric layered tissue with a solution that enables the material to efficiently absorb the energy of the laser’s beam and for the fibres to weave among themselves in very localised points. This way, the fibres are stronger and the material is much more resistant. “The results of the studies both on the 3D tissue production methods as well as those related to the material itself have been excellent. The wear rates were reduced significantly and the lifespan of the implant increased noticeably thanks to the surface welding, which makes this a viable option for replacing cartilage in vivo,” adds Sánchez.